Of course, promptly after leaving Pitlochry, I forgot about the promotional materials (who plans things several months in advance?!). Luckily for me, I married well. My Irish-Colombian surprised me for my birthday weekend, planning a trip back to Pitlochry with tickets to The Enchanted Forest booked well in advance. If you’ve been before, you know how magical it truly is there. If you’ve not been (I’m looking at all my Scottish friends whom I’ve chastised already but will do so again! ), you’re missing out big time. Go. Now. Well, go next year because tickets have been sold out for a while even though we’re only half-way through the monthly event. Book early, don’t worry about the weather, and enjoy! 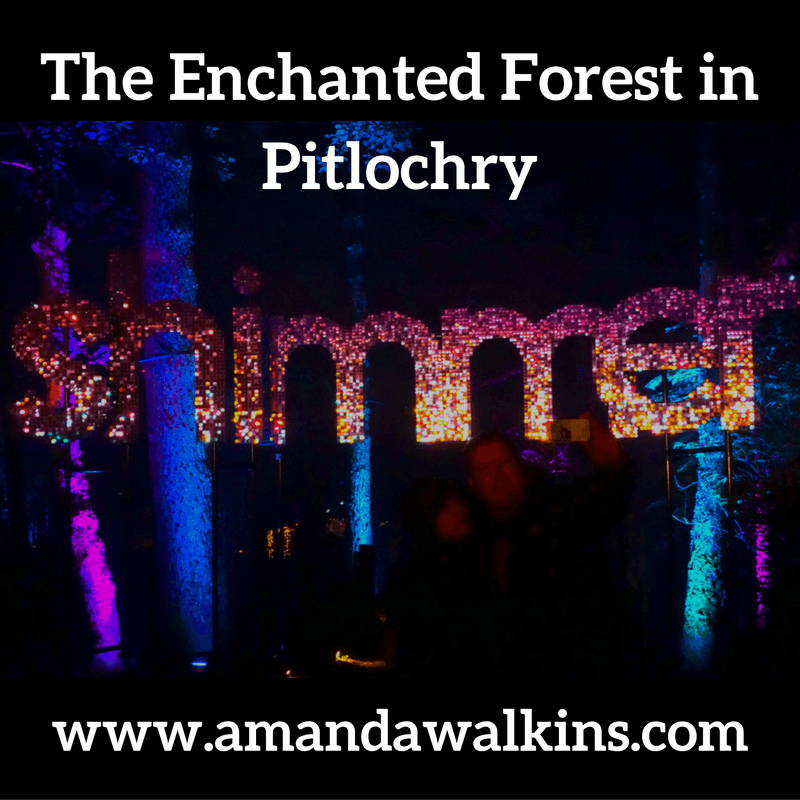 The Enchanted Forest is now in its 15th year as an annual event in Pitlochry. Taking over Faskally Wood just outside Pitlochry, The Enchanted Forest is created anew each year with unique lighting and musical shows. You can easily walk along the well-lit path to watch – and even interact – with the various displays. Basically, picture Fern Gully or Avatar. Twinkling lights in the forest, the smells of nature but the sounds of music. Magic! While I can’t speak for other years of The Enchanted Forest, I can relay the many confirmations offered by locals that this year is the best show ever. I’m sure should you come next year, that will be the best show ever! Regardless, I adored our several hours wandering through this magical display. This year’s theme is Shimmer, and shimmer the forest did indeed. It helps that Scottish weather is reliably damp, so an evening mist or drizzle makes the lights shimmer even more! They reflect off each little droplet still clinging to leaves along your path, so you won’t be lacking vibrant color everywhere you turn. A well-defined path guides you around in a figure-8 shape, passing various specified displays while you can still hear the lingering music from adjacent spectacles. Personally, the very first display was actually my least favorite. It made me concerned that the event wasn’t what I had anticipated. The very first display features fast, loud music accompanied by lots of flashing and dancing strobe lights. It almost felt like a nightclub, but I was layered up and standing in the middle of the woods. Quite happily, everything else was wonderfully better! I absolutely adored the dangling light display we could walk through. Standing outside the display was impressive, but being inside and amongst all the dangling changing lights was so much fun! And everyone around us was just as enthralled – the energy was truly electric. If you read about one of my favorite days ever while living in Roatan, you might remember I absolutely loved that night dive where we were surrounded by countless string of pearls underwater. This reminded us both of that dive. Though nowhere near as naturally magical, it was still incredibly beautiful. I also loved the fairy field – at least that’s what we called it for its hundreds of tiny lights placed around the forest floor like a magical carpet. Both sides of the path were filled and the lights changed color every few seconds, creating a landscape of art and making us feel like we were amidst Scotland’s famed fairies themselves. By far, the most impressive and mesmerizing display was the water spectacle. Having listened to the story told at the beginning of our journey (more on that below), this water and light display was absolutely breathtaking! With a fine mist spraying out of Loch Dunmore, projected lights created what appeared to be a giant hologram. Dancing figures and shapes filled the air over the lake and up into the surrounding trees. We watched the full show three times in a row just to try to truly embrace it all. Each year, a storytelling yurt is placed by the entrance to the actual exhibits. I highly recommend you pay the extra £1 to go inside. First of all, it had just started to drizzle as we got off the bus, so stopping into the yurt offered a dry reprieve and just enough time for the drizzle to stop. Secondly, it was so warm and cozy inside! Third, I am an insatiable fan of storytelling. While my work is written, I adore spoken word and storytelling. There is something utterly captivating about listening to another person relay a tale. It’s part of our nature and it’s what’s kept us alive through millennia. It has been through storytelling around a fire that we have progressed, that we have shared knowledge, and that we have challenged ourselves and each other to learn more. Storytelling today is considered to be a fine art – the written word is widely available to the masses so spoken word has been lost in that advance. Spoken word is still part of human nature, however. It’s why we read bedtime stories and sing lullabies. It’s why we listen to music and gather around a dining table with loved ones. Inside this cozy storytelling yurt in The Enchanted Forest, I found myself completely entranced while listening to the story of the great raven, creator of life. We all sat in a semi-circle with the kids up front, wide eyes and mouths agape. The storyteller sang her songs and animatedly shared the tale of Raven, who whipped the Earth into being with his wings and then offered his human creations both fire and water to help them survive. The magic wasn’t lost on adults as we all very reluctantly got up and headed out into the forest after just this one tale. Of course, true storytelling isn’t a quick event – it took our storyteller nearly 25 minutes to weave this tale through song and spoken word. It is an incredible art form. When visiting The Enchanted Forest, the storytelling yurt is absolutely not to be missed. How to get there: There is no vehicle access to the forest – you must utilize the buses running to and from Fisher’s Hotel in the middle of town. There will be plenty of staff on hand to answer questions, but the system is simple. Line up at your allotted ticket time and get on the bus when it pulls up. Listen to the entertaining and informative recording on the bus and within 10 minutes you’re in the forest! Time: You’ll receive a specific entry time, which is the time you’re meant to show up for the bus. Ours was 7:45pm, and we took the last bus home around 10:30pm. Buses run frequently and incredibly efficiently, but don’t miss the last one! Other Details: There is mulled wine and hot chocolate, plus little snacks for purchase along the way. There are also plenty of bathrooms and trash bins available. Please take care of nature and throw your trash away properly. If you have more questions about The Enchanted Forest, or to keep an eye out for when tickets go on sale next year, head to the Enchanted Forest website. There was a place to roast marshmallows, so clearly my Irish-Colombian couldn’t resist! Liked this post? Go ahead and pin it!